It’s that time of year. The snow is falling and temperatures have dropped. Every year your company has done the same thing for the holiday party and it’s time for a change. A Catered Affair has a menu chocked full with delicious traditional and non-traditional dishes that will start your company on a new trajectory for the holidays. Treat your staff to the best in corporate catering for the season. We have a full menu for a sit down dinner or an appetizer party menu, special for the winter and holidays. 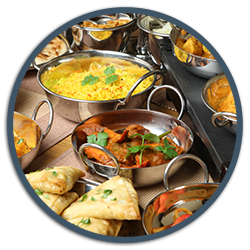 As you’re deciding on the details of the party, if you decide to have a themed party and want food to fit the mood, we have our regular corporate menu full of items to choose from. You could throw a Greek themed holiday party and serve a Greek feast or our Greek Souvlaki which comes with a huge 15-inch Souvlaki skewer with a variety of meats, rice pilaf, pita bread and other sides and dipping sauces to compliment the theme. You could also serve an Italian, Asian or American food for your holiday parties to go right along with the party theme. Look through our full range of menu items to see what best suits your gathering. Whatever the direction of your party, make it A Catered Affair and call us for your event. We offer equipment rentals, flowers and photography to complete the party look and experience. We offer free estimates for your corporate event. We pride ourselves in being sustainable at every event, no matter the size of the party. Have confidence in us; we are Vancouver’s premier catering service.